The avalanche was a hard slab, triggered by one or more party members at the bottom of the slope. The avalanche was medium size relative to the avalanche path, large enough to bury or destroy a car (but probably not large enough to destroy wood framed house), and broke into old snow layers and to the ground (HS-AR-R3/D3-O/G). The crown face ranged from less than 1 foot (25cm) to over 12 feet (380cm) deep, with an average crown height of 5 feet (155cm). The slide was 800 feet (244m) wide, and ran 600 vertical feet (180m), and broke small tree branches up to 2 inches (5cm) in diameter. A significant storm cycle started on Sunday, April 14 with the arrival of a strong cold front. This storm generated a short period of 3-4 inches per hour snowfall rates. The 24-hour snowfall (HN24) total was 9 inches at the Colorado Department of Transportation snow stake near the accident site (Figure 15). A second significant storm system arrived on Monday, April 15 with more than a foot of storm snow by the morning of the 16th (Figure 15). Very strong south to south-southeast winds followed during the day of the 16th, which deposited a significant dust layer onto the snow surface (Figure 2). 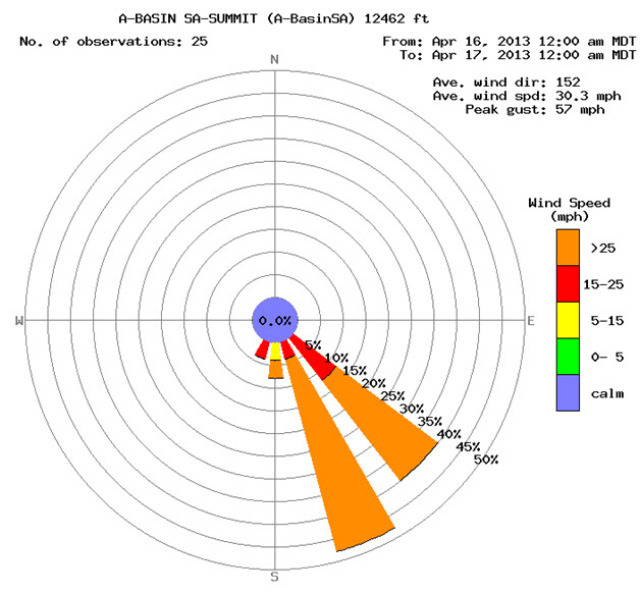 Significant wind-loading into the avalanche start zone likely occurred during the wind event on the 16th. A series of weaker storm systems with northwest flow followed from the 17th to the 20th with around a foot of new snow and with moderate to strong westerly winds (Figure 3). Periods of convectively-enhanced snowfall occurred on the day of the accident. 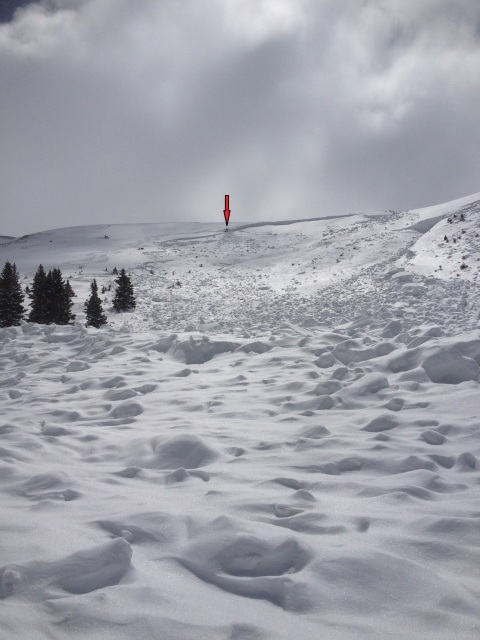 Snowfall totals for the week prior to the accident were around 3.5 feet at Loveland Ski Area 1.7 miles west of the accident site, with over 3 inches of snow water equivalent at Loveland Basin SNOTEL site (Figure 1). 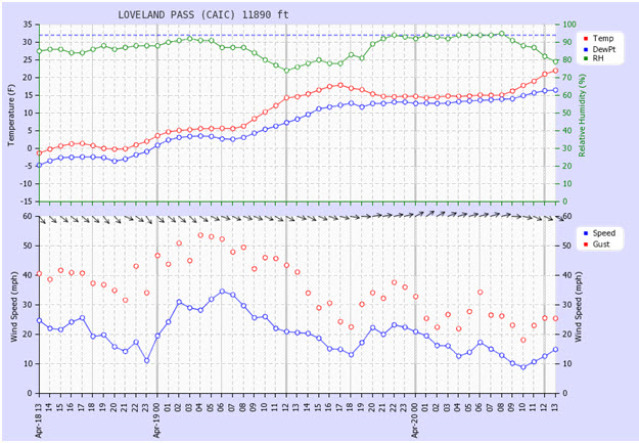 A shallow snowpack in November and December of 2012 and cool temperatures formed a pronounced weak layer of depth hoar across much of the Front Range, including the Loveland Pass area. This layer was most prominent on north through east aspects in the near-treeline elevation band. Steady snowfall and wind transport began in late January and extended into early March. This produced a series of wind slabs and small-grained layers of faceted snow in the mid and upper portions of the snowpack. The end of March through through April 20th (the date of the accident) was the snowiest period of the season, with 3 to 4 feet of snow and up to 4 inches of snow water equivalent (SWE). 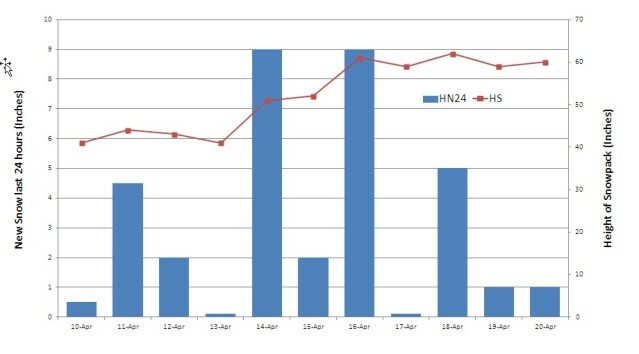 This brought the below average snow water equivalent to near historical levels (Figure 1).The April storms were accompanied by two dust events that left distinct, and at times reactive, dusty snow layers in the upper portion of the snowpack. 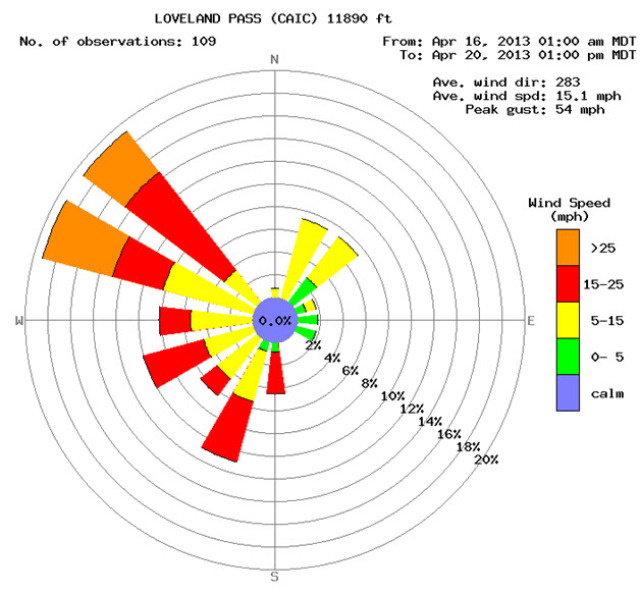 By mid-April, the snowpack near Loveland Pass was 150 to 200 cm deep, but some wind-loaded areas were over 3 meters deep. The upper meter of the snowpack had stiff slabs (Hand Hardness Index vaules of P and K) slabs 10 to 70 cm thick. There was a prominent layer of depth hoar capped by a thin crust, 20 to 30 cm above the ground. 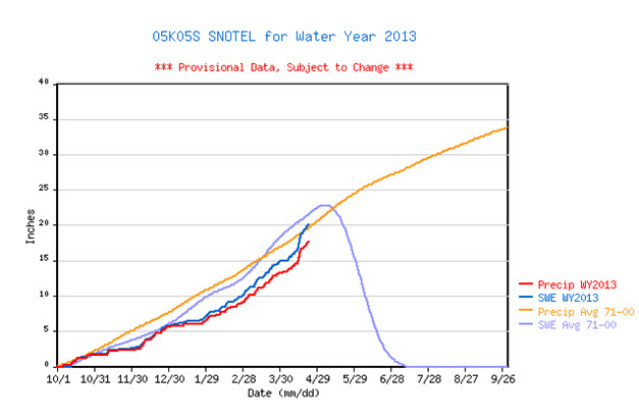 The bottom 25 cm of the snowpack consisted of well developed but rounding depth hoar. 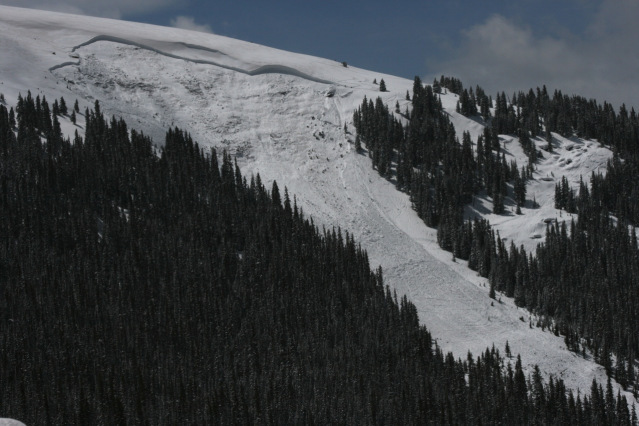 The rapid, heavy load from the April storms initiated a deep-slab avalanche cycle in the Front Range and Vail-Summit forecast zones. Large deep slabs, running on the buried depth hoar layer, were triggered naturally and by backcountry travelers in the several days leading up to the accident on April 20th. 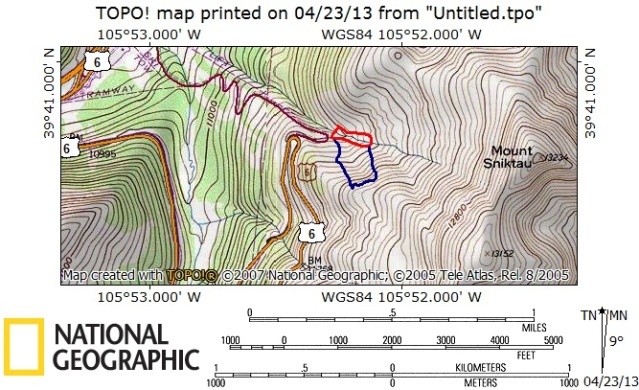 This included a fatal accident in the Vail Pass area (Figure 16) and a natural cycle in the Straight Creek area (Figure 17) on April 18th. 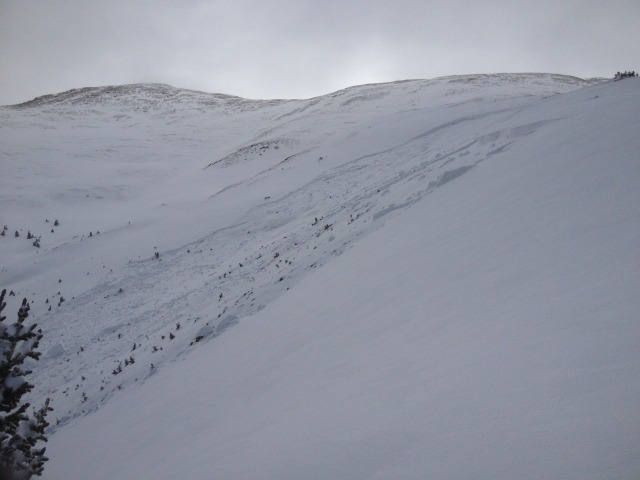 All of these deep slabs, including the avalanche discussed in this accident, ran on similar terrain: north-facing slopes, 32 to 42 degrees steep, and in the near-treeline elevation band. All of these avalanche released from low down in the start zone. A large group of backcountry enthusiasts taking part in the Rocky Mountain High Backcountry Gathering met in the parking lot of the Loveland Ski Area on the morning of April 20th. The event was organized to promote backcountry snowboarding and avalanche safety. Several smaller groups departed the ski area parking lot between 9 and 10am for some short backcountry tours, with the intent of meeting back up in the parking lot in the early afternoon. A smaller group of 6 (4 snowboarders on splitboards, 1 on approach skis, and 1 skier) departed the parking lot shortly before 10am and headed up towards Loveland Pass on U.S. Highway 6, intending to do a short (~1 hour) tour in the Sheep Creek drainage. The group read the CAIC avalanche bulletin together, and discussed the deep persistent slab problem. 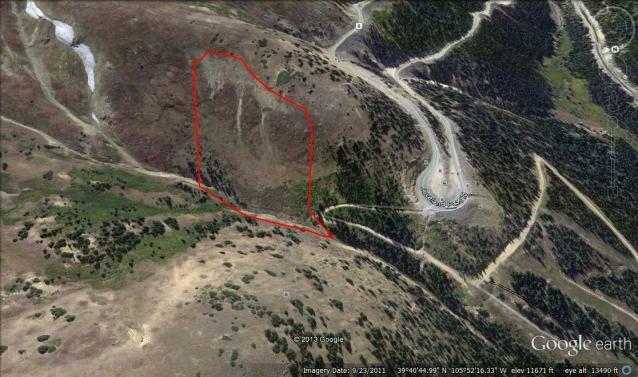 With this in mind, they decided that they would head in from the upper-most switchback (Scotty's Corner) on the old summer road, cross the Sheep Creek drainage gully, and ascend a few hundred vertical feet onto northwest-facing slopes of Mount Sniktau. They aimed to avoid the more north-facing slopes which they recognized as a threat, by crossing well below the start zone, in the runout zone, to reach what they deemed safer terrain. The group, in climbing mode, traveled a few hundred yards from the highway down the old summer road until it emerges from the the trees into the open alpine area of the Sheep Creek drainage. They decided to spread out with approximately 50 feet between people as they crossed below the north-facing slopes, and head for a small stand of trees on a small knoll on the far (northeast) side of the open slopes. The first two members in the group had reached the small stand of trees, with the other 4 group members close behind, when they felt a large collapse and heard a whumpf. It took several seconds for the crack to propagate uphill and release the deep slab. In those several seconds, they all ran for the far end of the slope and towards the small stand of trees. The avalanche was quite large and engulfed the entire group from above at approximately 10:15am. 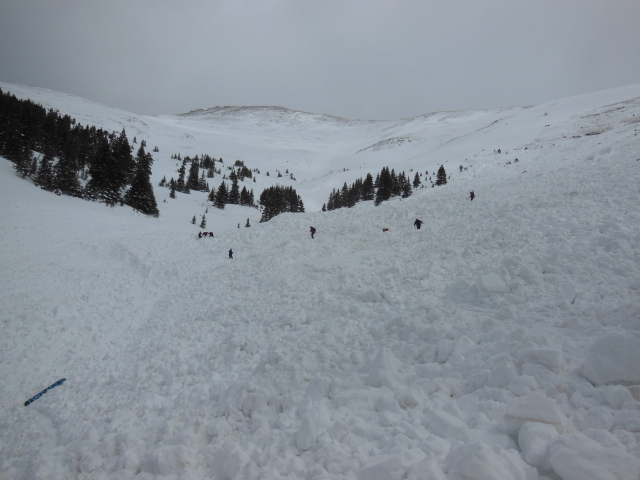 The avalanche pushed all group members between 5 and 20 feet into the Sheep Creek gully. Five of the six members of the group were completely buried. The survivor was 3rd in line at the time of the accident, and was partially buried in very close proximity (touching) to the two group members in the front of the line. The survivor came to rest in an upright semi-seated position with his lower left arm free, and his face very near the surface. He was able to clear the snow from his face, and at that point could breath freely. He then began slowly moving snow away from his face and head and trying to free his right arm from the snow. The survivor continued to yell for help, but to no avail, as there was no one left unburied to hear him and no other people in the area. The survivor was stranded in this position for approximately 4 hours before rescuers arrived at the scene. Two highway avalanche forecasters from the Colorado Avalanche Information Center (CAIC) drove over Loveland Pass to Berthoud Pass on the morning of the 20th. 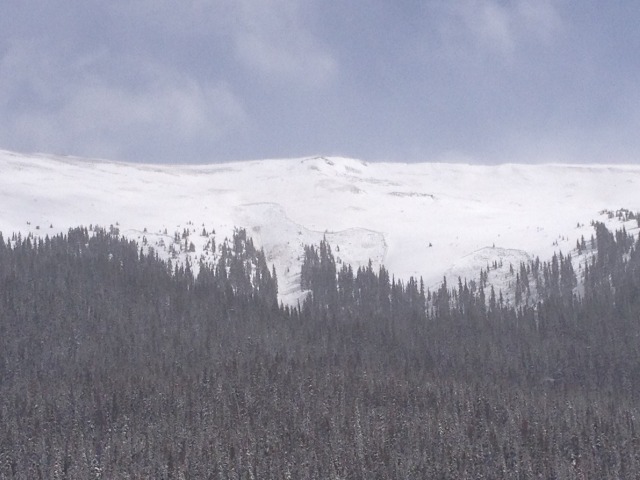 They noticed the avalanche around 12:15pm from the Interstate 70 as they were driving back from Berthoud Pass. They headed up Loveland Pass to investigate, and by 12:45pm they were walking down the summer road to the edge of the debris. They turned their beacons to search mode, but did not detect any signals. 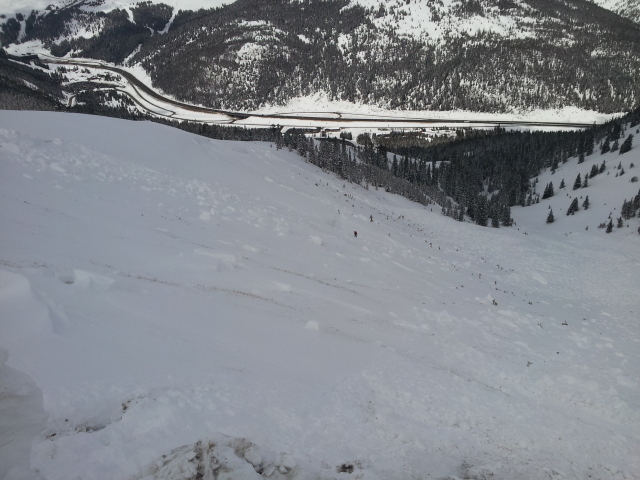 The victims were out of range on the far side of the avalanche debris. They used binoculars to inspect the debris field and look for tracks leading into the avalanche, but did not see any signs of human involvement. The CAIC forecasters then drove back down to the Loveland ski area arriving around 1:30pm, and asked participants at the Rocky Mountain High Backcountry Gathering if they knew of the avalanche and/or if anyone in their event had triggered it. At this point several people at the gathering mobilized, knowing that a group of 6 had headed towards Sheep Creek that morning. The first two responders (including a Loveland ski patrol member) arrived at the avalanche site around 1:45pm and initiated a beacon search. At the same time, a group of two arrived at the scene having skinned up Sheep Creek. A few minutes later, a 5th responder attending the event arrived to help. Within minutes they located the first beacon signal. The victim was towards the back of the line at the time of the accident, and buried closer to the west (highway) side of the debris. The victim was buried 6 to 8 feet deep. The 5th responder, who was on his splitboard in uphill mode, went to the far (east) side of the debris to search for more victims, and following a beacon signal, came upon the partially-buried survivor. The rescuer had multiple signals, and knew there were two other victims in very close proximity to the survivor. The survivor confirmed that two people were buried right next to him. The 5th responder, with help from a second rescuer, located the other two nearby victims who were buried 2 to 3 feet deep. They excavated the victims but they were deceased. They excavated the survivor and positioned him safely off to the side. By this time, additional resources, including Loveland Basin ski patrol members, arrived on scene. The rescuers located the 2 remaining victims. One of them was buried 10 to 12 feet deep and beyond the reach of probe poles. At least 2 members of the group were wearing avalanche airbags, but neither were deployed. Other group members were wearing Avalungs, but no victims were found with the Avalungs in their mouths. 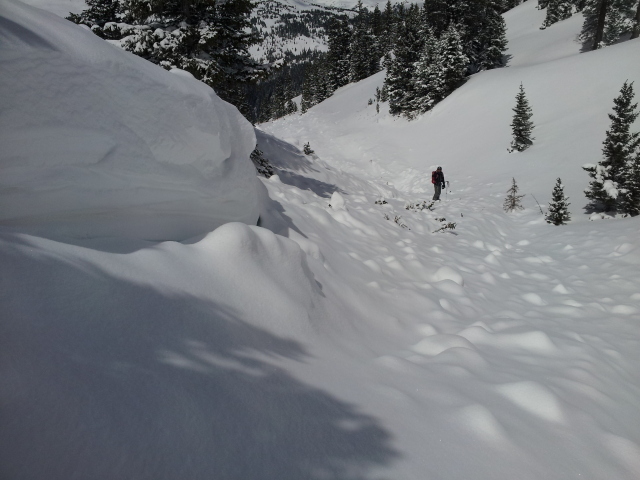 The most recent deep persistent slab avalanches occurred on Thursday in the Vail-Summit Zone, with natural avalanches in Straight Creek (west of the Eisenhower Tunnel) (see images here and here) and the fatal avalanche near Vail Pass. In many of the avalanches throughout the winter, the culprit weak layers were small facets above a thin crust, on top of depth hoar. Slopes where these layers remain weakest are north through east aspects near and above treeline. The slab above the weak layer may be very hard (P or K) and strong. The strong slab and stubborn, unlikely triggering, give the slopes a false sense of strength. Likely trigger points are where the slab is thin, like shallow rocky areas or along the margins or bottom of the slab. If you find the wrong spot, the resulting avalanche will be very large, destructive, and dangerous. Conservative and cautious route finding and terrain selection are the best ways to avoid the problem. 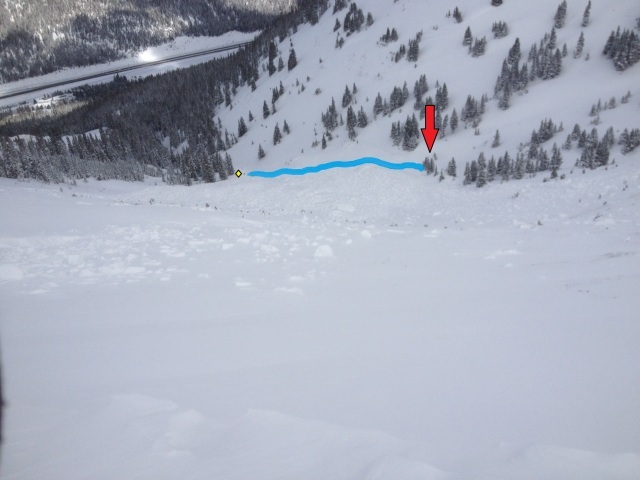 It is rare that we have as clear of evidence of a deep-persistent avalanche problem as we did the week leading up to this accident. Some of the group likely drove by fresh evidence of the problem in Straight Creek on their way to Saturday's event. 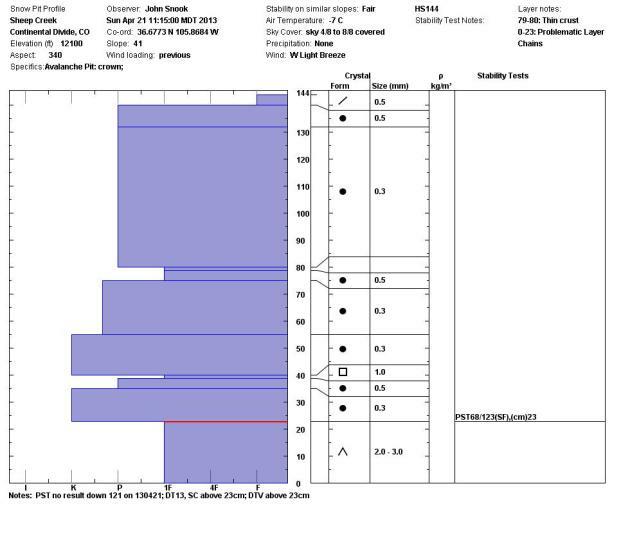 Before their tour, the group read about the conditions in the avalanche bulletin and identified deep-persistent slabs as the primary avalanche problem. They selected terrain that was less likely to produce a deep-slab avalanche, but to get there they traveled through a dangerous area. Unfortunately, the travel technique employed to mitigate the risk was not effective for the size of the avalanche that released. At least 3 members of the group reached the "island of safety" they had identified, only to be subsequently caught and buried in the avalanche. 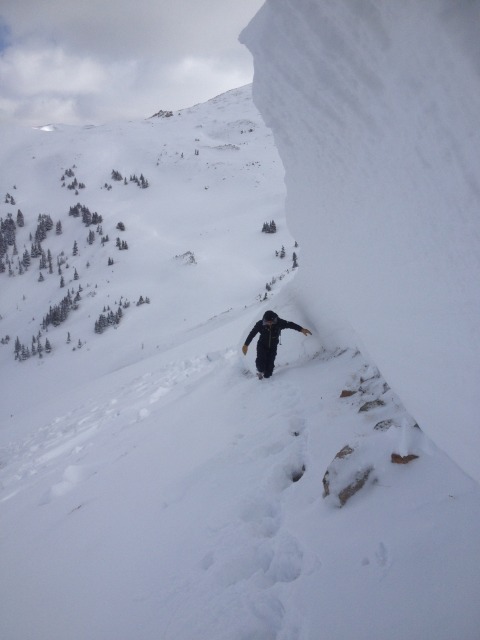 It is easy to underestimate the consequences of getting caught in a deep-persistent slab avalanche, because these slides are often much bigger than most of the avalanches witnessed by backcountry recreationalists. Deep-persistent slabs do not form every year, like storm and wind slab avalanches. The only effective travel technique for this avalanche problem is to avoid areas where deep slabs might release, or if the risk is deemed acceptable, expose a single group member to the danger. 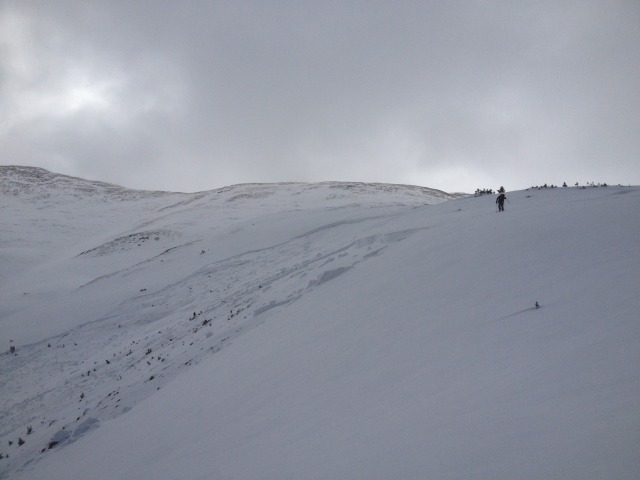 Spreading out often does not mitigate the risk to the group because these avalanches are always large and destructive. To forecast these events we look for patterns in the aspect and elevation of start zones and snowpack characteristics. Although we can often identify patterns in deep-slab avalanche cycles, it is very difficult to predict the exact location of the next event. Figure 18: Fracture line profile on lookers left side of the crown.